The best known voice in broadcasting will soon fall silent for a period of from two to three months, while Big Ben, whose reverberating boom has been described as 'the signature tune of the Commonwealth', undergoes his first big overhaul since 1934; or, rather, while the clock, which has come to be known by the name which rightly belongs to the great hour bell alone, has its entire works taken out and its four dials reglazed. During these months Big Ben's world-wide audience will hear the voice of another famous London bell - Great Tom of St. Paul's Cathedral, which, incidentally, 'stood in' for Big Ben in 1934 too. On 2 July Great Tom started work as a 'temporary', and its chimes are being broadcast for three months in place of those of Big Ben, whose clock mechanism is under repair. Great Tom weighs five tons four hundredweights, and has two quarter-bells. The sound of the bell is A flat, but heard at a great distance becomes E flat. 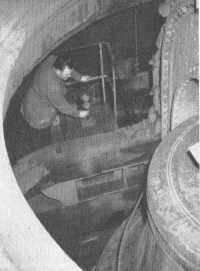 In the photograph an engineer is placing a microphone in poistion in the Bell Tower at St. Paul's Cathedral. On the right and immediately below Great Tom is Great Paul, which is only used for special occasions.